Jack - up position of pltform. Platform Area (mm X mm): 3 mtre X 2 mtre or less. 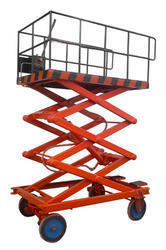 We offer mobile hydraulic platform of maximum working height 9 meters on tata ace vehicle. - Hydraulic hand pump or power pack operated - minimum height 100 mm to maximum height up to 3000 mm.